Hello everyone I completed this card for the Basic Grey Challenges see link http://basicgreychallenges.blogspot.com/ this week was a color combo of Black and Grey +1....add any color of your choice. I added red. Using BG from Scarlet Letter Fare thee well pp. The stamp is from Stamps in Motion 1999. 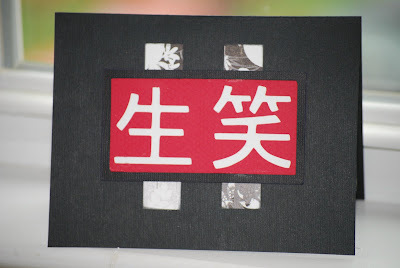 I embossed then using black detail powder. Black Bazzill card stock... and colored her in with LuminArte' paints Poppy red, Iridescent red,Siam white, Iridescent gold, and Honey amber. Using the cricut for the inside from My world cut at 2. Thanks for bringing us this challenge.....I really had to think hard....so much fun. Have a great day and thanks for taking the time to view. Wow, Dawn - your card is magnificent. The image is so detailed (and so perfectly done). Great idea to go for an Asian theme for this challenge. wow dawn so beautiful--you did an amazing job! 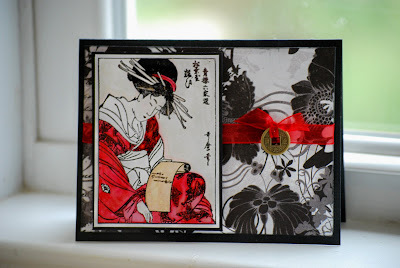 Hi Dawn - this is one stunning card !! Fantastic choice of papers for that amazing image and beautiful details. Thanks for sharing this with us at BG. Love this Dawn! Very awesome!